So another baby Mammoth has been recovered from the frozen permafrost of Northern Siberia. This find of a young female calf is in an excellent state of preservation. The carcase is virtually complete, although an ear is missing and so is the tail, probably as a result of the body being scavenged by wolves before becoming frozen, or perhaps as the carcass began to thaw out and before it was found by the herder. 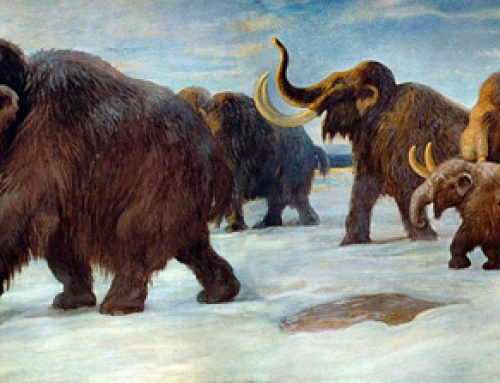 Over the years, many remains of Mammoths have been uncovered as the permafrost thaws, indeed Mammoths a very popular animals with children and they have been featured in a number of our blogs already. The 4 foot tall grey and brown carcass was discovered by a reindeer herder in May in the Yamal-Nenets region of Siberia. Scientists of the Russian Academy of Sciences Zoological Institute have removed it and it was one of the star attractions at the recent Mammoth Science Symposium. This is a big conference in which many palaeontologists and other scientists gather to discuss the latest Mammoth findings. I think that this baby Mammoth, named Lyuba (after the reindeer herder’s wife) is going to travel to Japan for further study. At the moment the precise age of this specimen has not been determined. It is estimated to be between 40,000 and 10,000 years old. During this period Mammoth populations began to go into decline, their demise may have been due a number of factors, over hunting by mankind, disease caused by the introduction of new species by man such as dogs, or due to climate change which led to the eradication of their grazing. Baby Mammoths are popular subjects for toys and models, we have recently worked on a range of prehistoric mammals including a soft toy baby Woolly Mammoth, a new prehistoric mammal model tube (mixing cave people and prehistoric animals – why not) and of course there is always the popular baby mammoth model from Schleich. Only a handful of Mammoth calves are known, perhaps the most famous is “Dima” which was found near the town of Magadan, Siberia in 1977. There has been a lot of speculation about trying to bring back the Woolly Mammoth (Mammuthus primigenius) by cloning. In theory it is possible to fuse the DNA of a preserved fossil such as Dima or Lyuba by combining the DNA with an egg cell of an Indian elephant which had been stripped of its original DNA. Much debate has taken place as to the legitimacy of this, after all, do we have the right to bring back such an animal from extinction. If we did, where would these animals live, their habitat has already been destroyed. Many scientists argue that the huge sums of money involved in this project would be better spent preserving the last two species of elephants we have left. gr8 ! !…now im sure tht they will be able to make the clone of mammoth!! !but it is harmful from sumwhere..idk…. Japanese researchers are already working on this project, having recovered Mammoth DNA from the bone marrow of a Mammoth carcase. The bone (femur, humerus? ), enabled the research team to take a sample of cells, these should lead eventually to the impregnation of an Indian elephant. A baby Mammoth within the next decade – it is certainly a possibility.